In most Waldorf schools – at least those in North America, Central Europe, and Britain – a very special early Winter festival takes place for the children. This is the Advent spiral, a beautiful spiral of Light which symbolizes each individual “I” receiving his or her Light in this time of growing darkness. Advent Sunday is the first of the four Sundays preceding Christmas (and if Christmas falls on a Sunday, that would be the fifth Sunday, not the fourth). Advent then is a period of time, not a single day or moment. It is a time of quiet preparation, of readying oneself to go without fear into the darkest time of year. 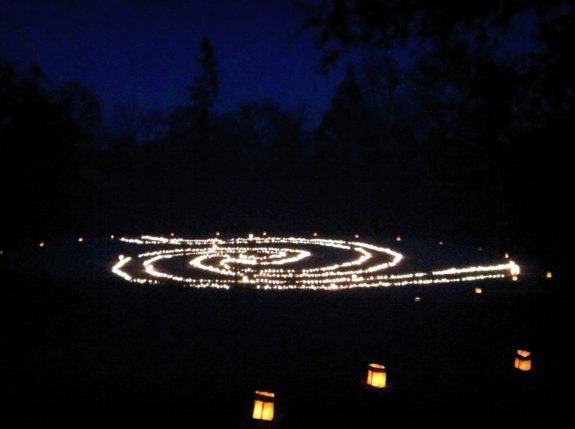 I have participated in many Advent spirals – as a child in my Waldorf school; as a teacher and parent in other Waldorf schools; in a Camphill community where we did a modified version of the Spiral; and in another anthroposophical community where we did a very special outdoor Advent spiral. I would like to share how these things are created in the hope that any family might find a way to recreate this very special ceremony with their families and perhaps with a larger community. The single most important element in an Advent spiral is the mood. The right mood of the person carrying it, the mood of the children – and, most importantly of the parents, as they come into it, is absolutely essential. Every step and detail must be thought through and planned (and every mistake and disaster anticipated) so there is no hurrying, no flapping about, no hesitation, no furtive whispers exchanged (“what do we do with the apples?” “Oh no, the wax is dripping on the pine branches”). One can thus see that the participating families must be thoroughly prepared in advance for what will take place! Basically, the idea is this: a large spiral created of pine greenery and interesting branches. It is decorated with crystals, pine cones, and other wintry items from Nature. In the center stands a nonwobbly stump with a flat surface – on this stands a large pillar candle, lit. Outside of the spiral, someone stands with a tray with one red apple per child. The apples need to have been cored, and a small candle put into each. Test out the apple candles to ensure they stand firmly – discard any which have a tendency to fall over. One adult carries the trays and hands an unlit apple candle to each child as s/he, in turn, comes up to the spiral. The room with the spiral is dimly lit – if there are a lot of windows and you’ve timed this so that it is dusk when you start and dark when you finish – and by that time all the candles are lit, softly illuminating the room, you have Nature helping you create a wondrous mood. Someone might be gently playing Christmas carols on a harp or lyre. Or, if that’s not available, someone (an adult please) playing an alto recorder could be good. In a pinch, a few people softly humming carols can be very nice. What you don’t want is lively singing! So no “Jingle Bells”!! The room should be all set up first, and families collect in another space. No one can be late!!! No one can come in once you’ve started! Plan for this! Have everyone take off their coats and get sorted out before coming into the Spiral room. Everything should be as quiet and peaceful as possible – the children should do their running around and shouting outside before they come into this anteroom – once in there the mood must be quiet so they can absorb what will take place in the Spiral room. Babies and toddlers can be a problem – it’s harsh to say but it’s true. Having said that, if this really is done properly and if – this is a big if – the parents are fully on board and carrying the right mood in their hearts, most tiny ones are completely swept up by the reverential mood of peace and not a peep is heard. Older children can also be problematic (4 to 9 is about the optimum age for this festival). You might need to use older ones as helpers – holding the apple tray, standing to the side out of sight with the fire extinguisher, closing the door when everyone’s in, etc., etc. You don’t want clumps of giggling or sarcastic older children spoiling it! Appeal to their better nature – not by lecturing or scolding, but by giving them something to do. So now everything is set, and the leader opens the door to let everyone into the dimly lit room. Other adults in the room start to gently hum carols – or a lyre is played, etc. Everyone takes their seats – hold this tightly – be like an usher, quietly showing people where to sit. You hum the carols too so as to let everyone see that this is not a time to talk. Everyone is now seated. Start with someone who knows what they are doing – there is no verbal instruction, no welcome, no little speeches, no ‘what shall we hum now.’ Everything happens like clockwork. So the appointed child – an older one perhaps or an adult with a very small one who knows what she’s doing, approaches the apple candle person and is given an apple (No choosing! You don’t want some child going “which one – no I don’t want that one”). She walks the spiral, slowly. She approaches the candle in the center and lights her candle. She then turns back and finds a good place to put her candle amongst the greenery. If you have a large group, have the next person come up as the first is lighting her apple candle to keep things moving. If it is a small group, wait until she returns to her seat. Every child gets to come up – this is a ritual for younger children who do not yet fully have their own Light and so must take from the Central Light. This is not for teens or adults. If a child is too shy to come up on her own, then it’s fine for an adult or teen to accompany her. When we were in Camphill (anthroposophical intentional communities for developmentally disabled adults), we had an Advent lemniscate where two people, each with an apple candle, would walk the lemniscate and exchange their Lights in the center and then continue the path. This was felt to be appropriate for adults. Once everyone has finished, sit and admire the lit candles. The room should only be lit by the candles. Continue to sing quietly. Then the leader, at the right moment, quietly opens the door for families to quietly – in silence or still singing/humming – to file out. Make sure a garish light from that room does not spoil the Spiral room. Ensure everyone is silent or humming as they get their coats on and go home. There should be no talking or running about – let the image of the Lit Spiral work on the children as they go home. Once everyone is out, the leader and her helpers can extinguish the candles. No child should be present as this would spoil it for them. Collect up all the apples. I suggest you do not hand them out – maybe tomorrow people could get them – or perhaps someone will take them home and make apple sauce (don’t let the children see them!). If you start to hand them out you’ll inevitably get “I want that one” “That’s not my candle!” etc. which will spoil the mood. You can also do this festival outside – in a wooded grove is really wonderful. But the logistics can be challenging. Use little jars for the candles, not apples or else they’ll blow out. And try to incorporate a quiet, reverential walk to and from the spiral – seeing a lit spiral amongst the trees is magic. And Nature will be happy to help you create the right mood if you let Her. A few things to consider: make sure all the children have long hair pulled back and no dresses or skirts!! You don’t want to start a fire! Have a fire extinguisher and/or pail of sand or water nearby or else you’re bound to get a jittery parent who keeps hopping up and fussing as s/he worries about fire. If a child puts a candle in an awkward place – on the path itself or where it could set something alight, the leader should just quietly help the child select a new place. And one gets quite fascinating insights into one’s child as they do this – do they hesitate to enter the spiral? Do they rush through or walk slowly? Do they immediately set down their apple candle or take it almost to the beginning of the spiral? Do they even step over the spiral in a rush to be through?! I hope you and you family will enjoy this very special and reverential festival! I participated in a spiral once at the 79th st waldorf school and it was lovely and the mood was everything just as you describe. Thank you for the clear description and emphasis on reverence. It is hard to get started with teaching your child by the Waldorf method when one was jerked up in the public schools. Resources are plentiful, but not always easy to understand or be comfortable with. Your post was both informative and DOABLE! Thank you! I think well wait till next year when our almost 2 year old is almost 3…wish someone else was doing this in our town for our almost 5 year old! sounds magical. What can we do in Australia? Has anyone got a suggestion? Hi Maja, I believe the same festival came be held in the Southern Hemisphere as well.